I’m not sure if you’ve ever been in the designated driver situation where you end up at a soiree and the host assumes that the only guests not drinking alcohol are children? As much as I like Um Bongo it’s always a little embarrassing to reach the end of the carton and make that loud, conspicuous slurping noise while in the middle of a conversation. Down with this I say and hooray for the now bursting market that is adult soft drinks and cordials. I’m not sure why but all the ready-made ‘adult’ soft drinks available used to be either apple orientated or have grape juice in. I am really not a fan of grape juice; maybe because it tastes artificial to me and not at all like grapes. Not to worry though as this Rhubarb, Rosehip and Lime Fizz is a corker of a soft drink. Pour some of the Rhubarb and Rosehip cordial into a glass, however strong you like, then top up with some sparkling water. Add a squeeze of fresh lime juice and top with a slice of lime. I think this drink looks particularly inviting; the pleasing pink colour and refreshing green lime make you want to take a sip. The astringent rhubarb goes so well with the slightly medicinal rosehip and the distinctive lime rounds it off perfectly. 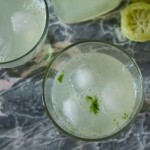 I hope the recent series of drink related posts has given you some inspiration and interesting ideas for combinations. I’m looking forward to a (hopefully) warm summer sipping on some more unusual beverages. Thanks to Mr Fitzpatricks for the samples. All opinions expressed are my own. I wish that would be served up at the parties I go to, looks different and delicious! Its a very pretty colour, I have just the glasses for it. Looks beautiful and so elegant Caroline…love it! The rosehip must add a perfect flavor to this. Looks lovely. 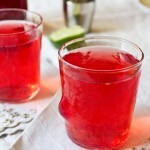 Now you’ve got me adding rhubarb and rosehip cordial to my ever-growing list of things I want to make! THIS is the kind of drink I want at a party. seasonal, fresh, and exciting. Se ve rico y refrescante me encanta,abrazos y abrazos. This has to be one of the most beautiful trios ever! What a gorgeous beverage! I , too, am waiting for warm weather to make an appearance…we will be close to freezing here tomorrow morning…ugh. Ooh! This looks perfect for summer! Such a beautiful color and refreshing drink! you got all these as samples? lucky girl! me too love the pink colour! what a great combination of flavors!! 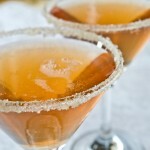 i’d love to be sipping on one of these while relaxing outside with a book! Beautiful combination – light, fruity and fragrant. I’m a big fan of rhubarb!